Phil Mickelson and caddie Jim Mackay confer during the 2012 PLAYERS Championship. Caddies perform a variety of roles at different levels of the golf world. For the casual player, a caddie may simply carry your bag and keep an eye on your ball. On a major pro tour a caddie is often a key member of a player’s team, providing vital support and information that may make the difference between victory and defeat. But there’s no doubt that caddies can be useful to players across the golfing spectrum. While many golfers are physically fit, others may not be in shape to both walk the course and transport their golf bags for a full round. By employing a caddie, however, the less-than-fit golfer may be able to avoid the necessity of driving a cart and can at least derive the exercise benefits of walking for nine or 18 holes. A good caddie performs many services during a round, in addition to lugging your clubs across the course. Caddies typically track your shots and help prevent you from losing your ball. They’ll often clean your club after a shot or wash your ball after you finish a hole. Caddies may also provide advice regarding club selection and strategy, particularly for players who are new to the course. For golfers who enjoy trying out elite public courses, a caddie is an invaluable resource. For example, former United States Golf Association official Dean Knuth says the best caddies may save you 10 strokes during a round at a tough layout due to their knowledge of the course, advice on club selection, and their help reading the greens. Caddies for top pro golfers are highly valued, and highly paid, employees. After winning the 1964 British Open at St. Andrews’ Old Course -- which he’d never played previously -- Tony Lema gave veteran Scottish caddie Tip Anderson much of the credit. 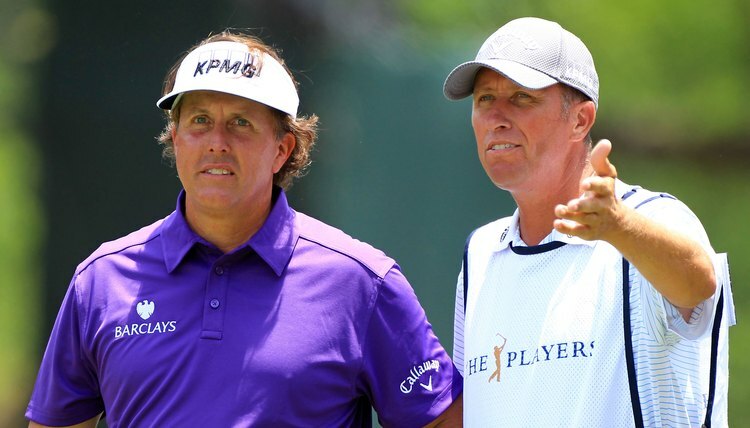 The Phil Mickelson-Jim Mackay partnership began in 1992 and remained strong as of the date of publication. Mackay charts each course, often adding a variety of minute details. For example, Mackay recorded every shot Mickelson took at Colorado’s Castle Pines Golf Club as the two tried to figure out how to handle the course’s elevation, which is more than a mile above sea level. Additionally, Mackay noted the air temperature, wind speed and direction, and time of day of each shot. Mickelson went on to win the International at Castle Pines twice.